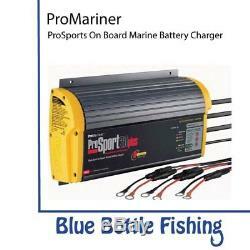 ProMariner Pro Sports 20 On Board Marine Battery Charger. 12/24V 20 AMP 2 Bank. ProSport Generation 3 On-Board Marine Battery Chargers incorporate all-digital microprocessor control. Like no other, the new ProSport Series provides automatic installation feedback with its exclusive "System Check OK" and individual "Battery Bank Trouble" LED indicators, and also has the most advanced energy saving mode. After fully charging and conditioning batteries, ProSport's Energy Saver Mode will monitor and Auto Maintain batteries only when needed to maintain a full state of charge, resulting in maximum reserve power performance and lower AC power consumption and operating costs. ProSport incorporates Distributed-On-Demand Charging technology, taking 100 percent of the available charging amps and distributing them to any one or combination of all batteries as needed for faster charging. ProSport is 100 percent waterproof and shockproof, weighing 40 percent lighter than older technology epoxy filled chargers providing cooler operation and greater reliability. ProMar Digital Technology: Microprocessor and software controlled pulse charging technology delivering a 40 percent lighter design than the previous generation of epoxy filled chargers, cooler charger operation and faster charging. System OK and Battery Bank Trouble Status Indicators: Advanced technology eliminates time consuming troubleshooting by clearly indicating system and battery connections are OK or if a fault is present on a specific battery bank. Digital Multi-Stage Performance Charging: Fully charge and extend the life of your batteries - automatically charges, conditions and safely maintains all batteries on board for maximum time on the water. Energy Saver Mode: After fully charging and conditioning batteries, ProSport's Energy Saver Mode will monitor and Auto Maintain batteries only when needed, maintaining a full state of charge. This significantly reduces AC power consumption, lowers operating costs and maximizes reserve power performance. Storage Recondition Mode: During short or long-term storage, ProSport automatically reconditions all batteries on board once a month for maximum battery life and performance. Distributed-On-Demand Technology: Automatically charges and maintains your engine crank battery while distributing all remaining charging amps to trolling motor or house battery(s). Digital LED Display and Battery Type Selector: LED indicators for Charging, Conditioning and Auto Maintain modes in addition to AC power and selected battery type (2 charge profiles to choose from with a 3rd high performance AGM HP profile on the ProSport20 Dual only). 3 digitally selectable charge profiles including a once-a-month storage reconditioning mode for extending battery life. Built-in Quality and Safety: Compact and rugged extruded aluminum design, dual in-line DC safety fuses for trolling motor and house battery banks. Built-in over-voltage, overload, over-temperature, reverse polarity and ignition protection. Based in the Hills District of Sydney, we provide our customers with the best quality fishing and marine products. Our range of products include brand like Chiller Fish Bags, SIMRAD, Lowrance, JL Audio, Bubba Blade, Reelax, MotorGuide, Minn Kota, Cannon, Hella, GME all a must for any angler and their boat. With our trained and qualified staff, we now also offer a fitting and support service. If an item is ordered, but out of stock or will be delayed, we will inform you. All prices are shown in Australian Dollars. For conversion we recommend using our currency converter on the home page. No dangerous goods will be delivered overseas - such as Batteries. If such items are found to be defective upon arrival, such items may be exchanged for an equivalent new item only. The credit issued for any item received in such condition will be discounted or the return will be rejected at our discretion. We require the return of the damaged or defective part. Part numbers of the defective or damaged parts, as well as digital photos showing the condition of the part, are extremely helpful in expediting such replacements. (6) I received an item I did not order. How do I return this item? To facilitate return of the item. (7) I dont understand the installation instructions. Can I return the item? As with any aftermarket part, proper installation requires a certain degree of mechanical skill, ability, and the proper tools. We always recommend having a qualified, competent mechanic install parts that are beyond customer abilities. When ordering, please keep in mind that many of our products are designed for worldwide distribution and not necessarily for primarily English-speaking markets. As such, many of our products include only an exploded parts installation diagram with sparse notes which may or may not be in English. We try to be as detailed as possible in the product description, and in many cases we attach digital copies of the mounting diagrams to the product descriptions on our website. In addition, we often post photos and installation notes on our website that are provided by other customers. We do not warrant the accuracy of this information and take no responsibility for damage or injury caused by improper installation of products presented on this website. (9) How do I arrange for a return of an item to Blue Bottle Marine? Please do not attempt to force a return by sending us a part that is not authorised for return as specified above or by specific confirmation from us. Chargebacks for goods delivered as ordered is theft. Customers placing orders with Blue Bottle Marine, consent to the terms of the policies outlined above. The item "ProMariner Pro Sports 20 On Board Marine Battery Charger. 12/24V 20 AMP 2 Bank" is in sale since Friday, September 29, 2017. This item is in the category "Vehicle Parts & Accessories\Boat Parts, Accessories\Electrical, Lighting".